First make the stock. Put the olive oil in a large, heavy-based saucepan. Add the vegetables and sauté briskly until starting to caramelise. 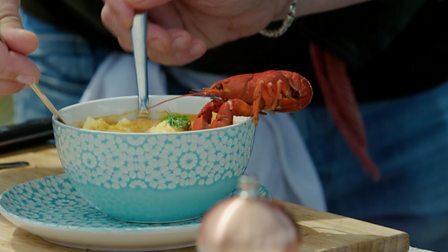 Add the crayfish shells and stir until any liquid evaporates off and they turn a deep red. Pour over the white wine and leave to bubble for a couple of minutes. Pour in 1½ litres/2½ pints water and the remaining stock ingredients. Bring to the boil then turn the heat down and simmer for 40 minutes. Strain and set aside. For the chowder, melt half of the butter in a large saucepan. Add the onion and sauté until translucent. Add the potatoes and leeks and stir to mix. Add the stock and season with salt and pepper. Bring to the boil, turn down the heat and simmer, uncovered, for about 15 minutes. At this point the vegetables should be tender. Stir in the dill leaves. Melt the remaining butter in a frying pan. Season the reserved crayfish tails with salt and pepper and add to the pan. Fry for a couple of minutes and add to the chowder. Divide the chowder between 4 bowls and top with a teaspoon of crème fraîche, serve immediatedly.